Reyna Films' Kung Mawawala Ka Pa and Star Cinema's May Minanahal shared top honors in the 1993 Metro Manila Film Festival. Kung Mawawala Ka Pa was awarded Best Picture and received 7 other awards--- Best Actress (Dawn Zulueta); Best Supporting Actress (Amy Austria); Best Child Performer (Sarah Jane Abad); Best Musical Score (Ryan Cayabyab); Best Original Song; Best Sound (Ramon Reyes) and Best Cinematography (Romy Vitug). May Minanahal won 9 awards--- Best Actor (Aga Muhlach); Best Supporting Actor (Ronaldo Valdez); Best Director, Best Story and Best Screenplay (Jose Javier Reyes); Best Production Design (Benjie de Guzman); Best Float, Second Best Picture and the coveted Gatpuno Antonio J. Villegas Memorial Award. Other awardees--- Best Editing (Augusto Salvador/ Doring Dorobo); Best Visual Effects (Bobby Pineda/ Doring Dorobo) and Best Make-up Artist (Teresita Dominguez/ Gaano Kita Kamahal) and Doring Dorobo for third Best Picture. 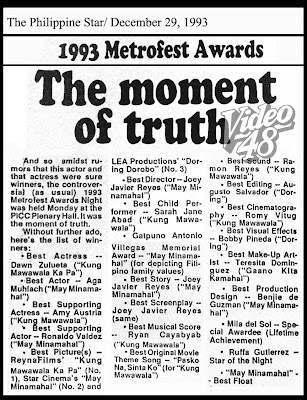 Simon, for me, it should be "Gaano Kita Kamahal" as Best Picture of the 1993 Metro Manila Film Festival and Boyet de Leon and Lorna Tolentino as Best Actor and Actress. 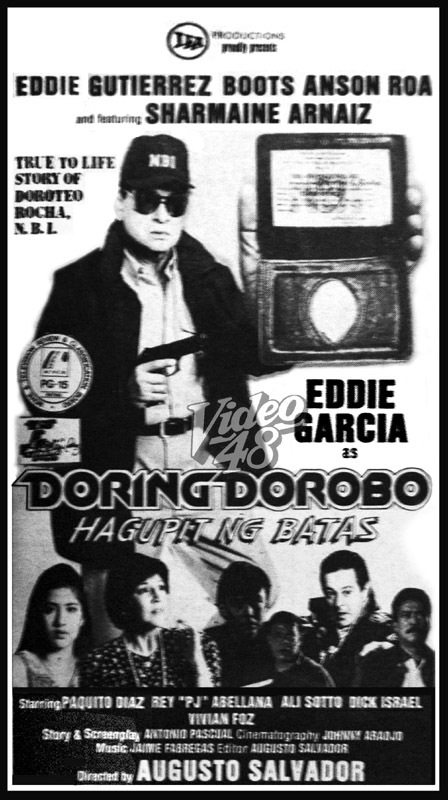 Masasabi kong isa ito sa mga pelikulang merong kurot sa puso. Pare-pareho kong napanood ang "Kung Mawawala Ka Pa", "May Minamahal" at itong "Gaano Kita Kamahal", pero mas nagustuhan ko talaga ang story ng "Gaano...". Choice ko rin James and "Gaano..." It was based on true story. 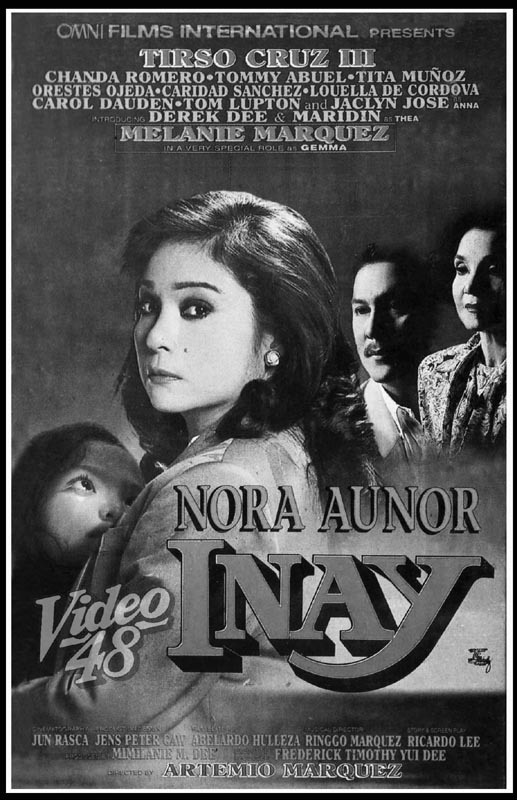 Just saw it again, superb ang acting nina Boyet de Leon and Lorna T. Btw, the movie will be shown again, Dec. 11 at CCP as part of the ongoing "Overlooked Films, Underrated Filmmakers," a project of SOFIA. 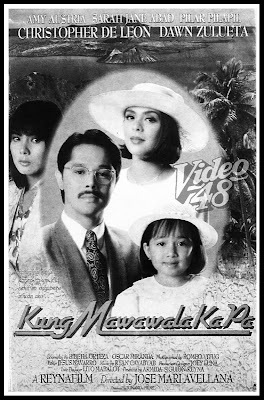 Gusto ko manood ng "Ito Ang Pilipino" sa November, sa "Overlooked Films, Underrated Filmmakers". Magpapa-reserve na ako kay Mr. Monchito Nocon ng seat. 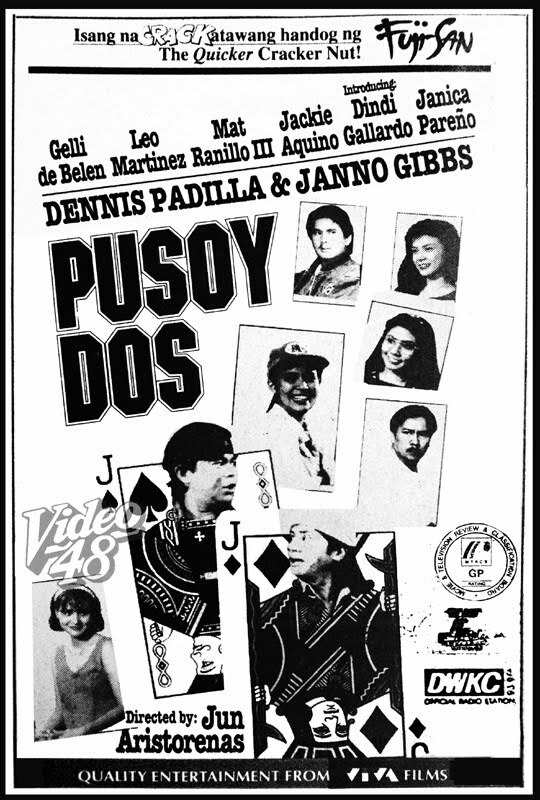 James, I've seen "Ito ang Pilipino" when it was first shown in 1966. But it's worth a second look. I hope they would invite Joseph Estrada, Barbara Perez and Eddie Garcia. That would be an eventful one! Hope I can make it!